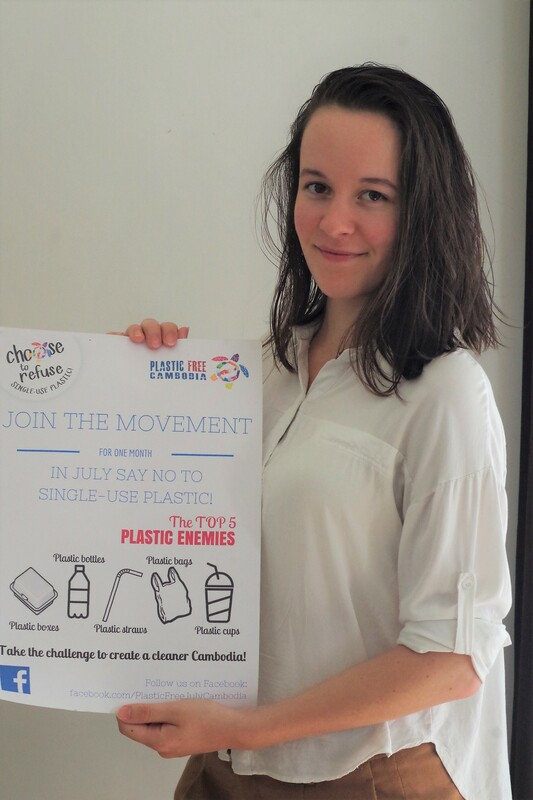 “I came to Cambodia for 6 months at the beginning of 2018 and I decided to work for Plastic Free Cambodia as their missions make people aware of the incidence of plastic pollution. Indeed, I discovered this beautiful country with great pleasure, but garbage along the roads clearly damages the image of Cambodia and are harmful for human health and the environment. This internship was part of my studies of Intercultural and International Management and Business Development. I discovered that one of the former student of my Master did a volunteering at PFC a year before me! My role at PFC was to develop a Plastic Free Label as we wanted to launch a service that could bond people who want to develop their business in a sustainable way. This label was a great idea because it creates a network of hotels, restaurants, cafés and bars which choose to reduce significantly their consumption of single-use plastic and to train their staff about this subject. This project makes sense in Cambodia as hotel trade and catering are part of the tourism industry, a pillar of the Cambodian economy, which is constantly growing for the last 20 years. I worked in Phnom Penh with managers of the food and housing industry to build audits and programs for our label. It was rewarding to meet all these people and visit their businesses. They were happy to share their experience with me and always looking for advice to improve their commitment in sustainable development. More and more people in Cambodia understand that having an impact on the environment starts at a low scale, which improves local initiatives. As I worked in Phnom Penh, I was independent and I had the chance to visit around Cambodia during some public holidays and weekends. You want more information Plastic Free Cambodia?